Ariane Bosquet was invited to Bamako, Mali, in July 2008 for an artist stay of one month with Chab Touré, gallery owner, photographer and art historian. After first making some classic paintings inspired by local colours, she had to find a different thread of what she used to do here in Brussels. She performed thus a work on the theme of doors she photographed throughout her journey. Old doors made of wood, of metal sheets, of iron, weathered by time. 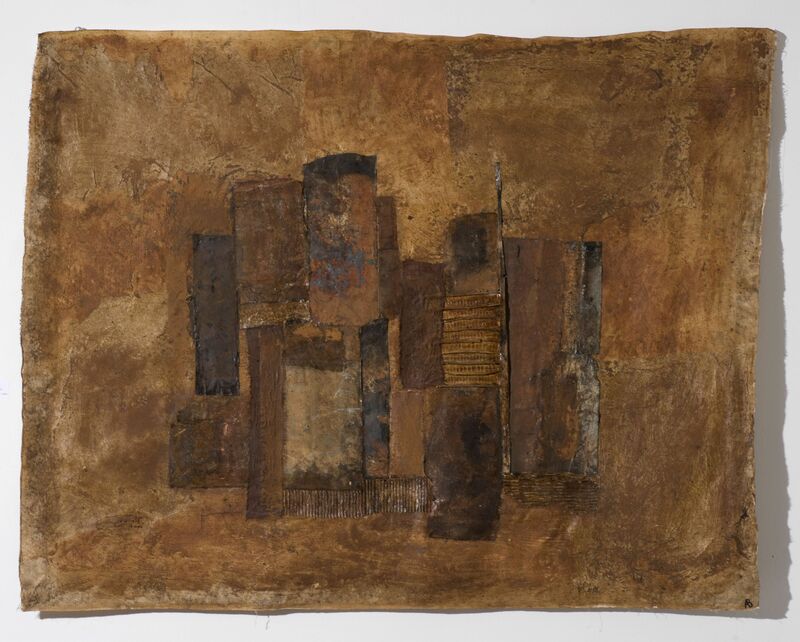 Recovering old rusted metal sheets along the roads to scrap merchants, she began to use them as framing support, by sticking small canvases worked with her papers, evoking doors. But that was not enough, she had to go further exploring this new material. It was, thus, during these three weeks, a permanent work in progress to stop achieving works incorporating materials worked even on metal sheet, and more and more moving away of the theme of the door ...: mix rust of time with her materials to make all one, not knowing any longer where one stands in relation to another, always looking for the footprint of time passing over things of life. In her 4th and 5th visits to Mali from November 2010 to April 2011 and in winter 2012, she recovers, works and assembles eroded metal, worn paper and fabric, old fences that this time she mixes with the orange banco, the red laterite and the sand of the Koundou dune of the Dogon village where she has stayed. She offers for the enjoyment of the Bamako public a series of powerful, sensitive and novel works evoking the Dogon landscapes. Techniques used I use different paper (tissue paper, packaging, old fax rolls, etc ...) glued to the raw canvas (covered with a transparent coating), which are then reworked in acrylic paint, natural pigments, charcoal, with paste on some places on different materials (sand, modelling paste, …. ), then scraped with sandpaper, repainted in successive layers, to arrive at a wearing effect, expressing the footprints of time on things. To enhance brightness, I sometimes use oil paint sticks, in the final layer in some places. Once the painting is completed, it is mounted on wood and framed. "A piece of broken wall, a ruinous bareness, an abandoned corner of glass... From space, I only see time... Time is there, it passes, I must attest it: make colours more tired, crumple more the papers, make materials more rustic until their scratch. Though I find the space overwhelmed with time, time overwhelms me and I in turn overwhelm paper, material and canvas, and all this only makes the same wear". "In the work of Ariane Bosquet, Brussels, 1959), time is an elusive conductive element. She manages to capture this impalpable notion within the space of a moment in its evolution. Who can say where these works constantly worked and reworked come from? Are they the product of a single mind or rather of a collective memory? 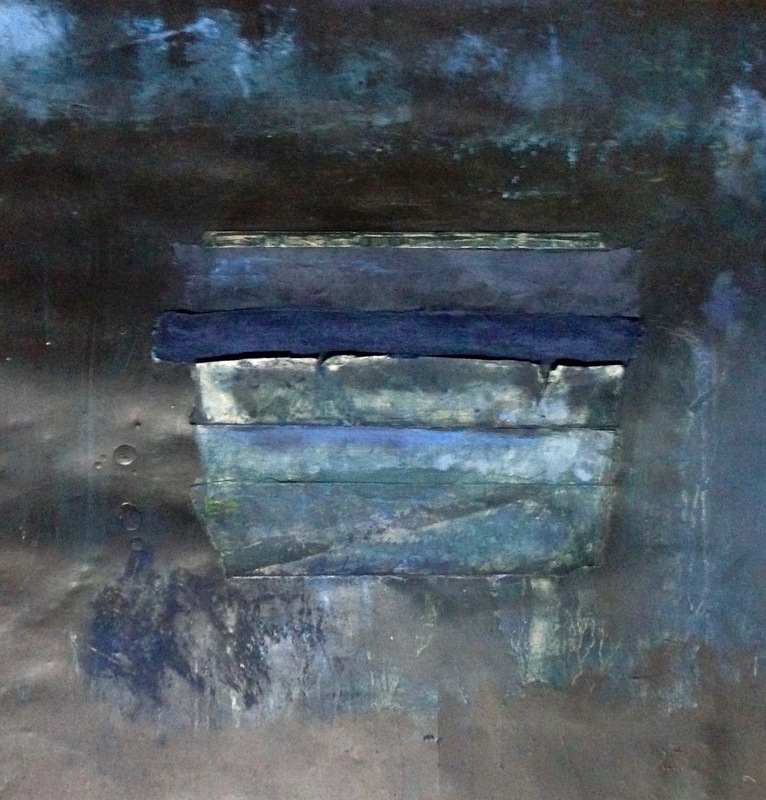 Coming out of the deepest abyss of the soul, works of Ariane Bosquet are repositories of a moment in time".